Paper Chef #14, as hosted by Belly-Timber and thanks to Tomatilla, has finally allowed me to play out my Ready-Steady-Cook ambitions! I have been dreaming of this moment. So I pocketed $3.55 and got cooking, only raiding my stocks of herbs, spices and pillaging a chicken breast from the freezer. Fry the onion until golden. Mix the yoghurt with the coriander leaves, ginger, garlic, salt, chilli and fried onion. Add the chicken and leave to marinate in the fridge for at least two hours or overnight. Rinse half a cup of quinoa in lots of water until the water runs clear. Cook the quinoa in boiling water to which you have added salt, a length of cinnamon, a few cloves and some cardamom pods, for 10 minutes until almost cooked. Drain and spread out on a plate to let the steam escape. Coat the bottom of a heavy bottomed pot with a good lid with some oil. Tip in the chicken and yoghurt mixture. Sprinkle with garam masala and the torn mint leaves. Top with the quinoa, spices and all. Make holes to the bottom of the pot with a knife and pour over the saffron infused milk and lemon juice. Put the lid on the pot and put on high heat for 10 minutes then turn to low for another 10. 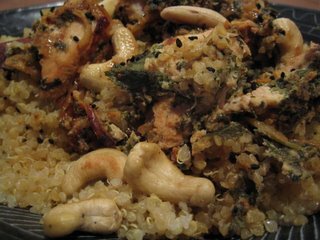 Tip out onto a serving plate and sprinkle with the cashew nuts and the cumin babies. Eat with your fingers as is the custom! This was a modified version of a chicken biryani recipe given to me by some friends from Hyderabad, the home of biryani. The original uses a whole chicken cut in pieces and, of course, rice. I have made a few adjustments over time such as leaving out the food colouring, using fresh minced chilli instead of chilli powder and using the spices I fancy at the time instead of garam masala. This has been my first time cooking, or eating, quinoa and I must say I am very pleased with the results! The black cumin babies are of course black cumin seeds. Seeds being "A ripened plant ovule containing an embryo" - sounds like a baby to me! Hah! Another "seed" interpretation. I love it! babies are all around - be aware!